Looking for an easier way to dust? The Guardsman Dusting Cloth might just be your answer. This treated cotton cloth works like a charm and can be used over and over again. Even when it looks filthy and couldn’t hold another bit of dust, it keeps on working! To remove dust and dirt, simply hand wash and allow to air dry to restore its dust-grabbing power. 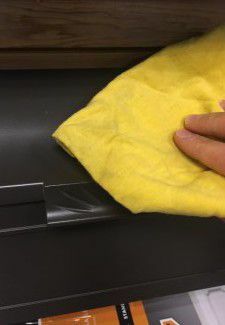 We love these cloths so much that we use them in each one of our departments repeatedly for keeping counters and products clean and dust free. They work great on our BBQ grills that tend to be magnets for dust since they are near high traffic areas. If dust needs to be tackled in your home, we suggest giving the Guardsman dusting cloth a try. A single cloth sells for just $2.99. If you really like them, we sell value packs as well. In-stock year round in our Housewares Department.